The Victorians loved colour, culture, collecting and clutter. The richness of their colour schemes can be seen in textiles, ceramics and paint. Plasterwork, particularly ceilings, were no exception. We are all familiar with the lovely ceiling roses in Victorian homes and how often have you seen them tastefully painted? Often as not they are either overdone with inappropriate colouring or painted in the same colour as the ceiling with no additional definition. Such a waste of a beautiful decorative feature. A renovation of a Victorian home undertaken by Amanda Richmond Chief Interior Designer at Balance Architecture + Interior Design featured a gorgeous ceiling rose but it had been painted by an amateur and it showed. The colours were segmented and separated. Whilst pink and green may be complementary opposites on the colour wheel, the painter had used pure green colour against pastel pink with a custard yellow in between. The body of the ceiling rose was left unpainted with dobs of gold appearing on featured rosettes. In combination this colour scheme was harsh, clashing and not restful to the eye. Amanda applied a softer tone on tone colour scheme with a soft cream replacing harsh white. Detailed colours added to the centre of the ceiling rose were copied from colours in the wall paper frieze, which had been repeated in the cornice also. The design idea is that colours must have a reason for being there and should harmonise with other elements in the room. You can see in the images the before and after effects and how jarring the original paintwork was compared to the soothing, harmonising colours applied during the renovation. A charming Victorian home has been tastefully and carefully restored to feature it’s original distinctive design, materials and workmanship. The original slate roof was badly damaged, the verandah had been modified over time and the chimneys were still as they were built but in poor condition. The verandah had been enclosed by filling in the vertical externals, which detracted from the original heritage style of the facade. Architect Andrew Fedorowicz of Balance Architecture + Interior Design was commissioned to lead the restoration, due to his immense experience at heritage restoration and renovation. 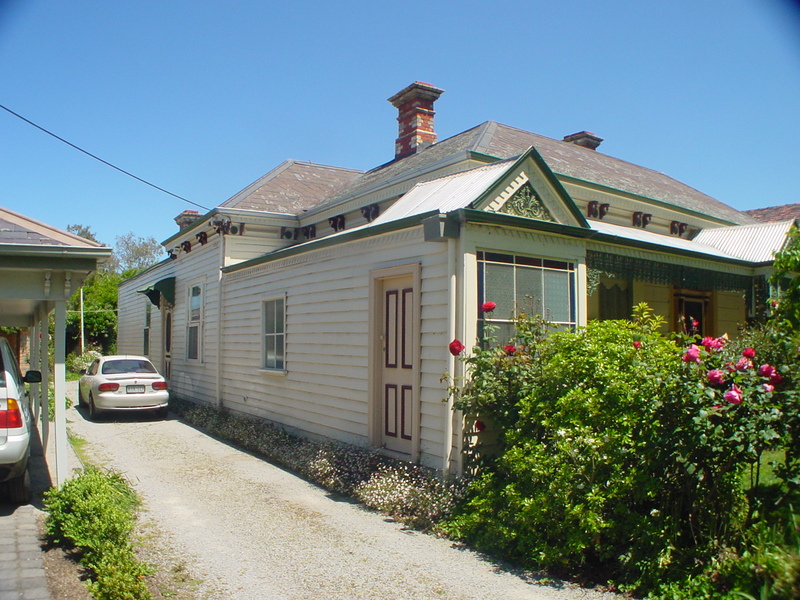 The verandah was restored as it would have been originally built with new lacework cast from original pieces. New timber posts were installed with sand cast capitals to match the original verandah and new tessellated floor tiles were installed in a traditional Terracotta and Wheat Octagon and Dot pattern. Unfortunately, the original slate roof was too badly damaged to restore, resulting in an entirely new slate roof being built. The building was further restored with the addition of new Gable detailing, which was re‐instated having been destroyed or removed from the original roof. A careful rebuild of the chimneys was achieved using the original bricks, which gives the building a wonderful completion. This type of renovation requires a sensitive and informed Architect to restore the building in an authentic way to it’s former design and style features. The team at Balance Architecture +Interior Design, Andrew Fedorowicz creating the architectural design elements and Amanda Richmond styling the interior, are often called upon to recreate the charms and delights of yesteryear buildings. There are a variety of ways to create mood in a space. Scale, texture and pattern will always work but the primary way to achieve a definite mood change is through the manipulation of light. In an interior design created by Amanda Richmond of Balance Architecture + Interior Design the kitchen had a high vaulted ceiling, with a timber lining in a dark wood, these darker hues could risk visually shrinking the space. This issue has been avoided by the introduction of natural light through skylight windows located in a south facing roof line. Also, the decorative leadlight panel above the doorway allows colour to filter into what is a soft palette of pale greens and grey offset by crisp white joinery. The primary material in this space is natural timber. It softens the look and adds warmth, both physically and visually. To extend the effect of natural materials the glass splashback colour is taken directly from the natural granite colours in bench tops. Lighting is both practical and ambient with task lighting under overhead cupboards allowing clear, focussed light to be directed to the work area where it’s needed most. Pendant lights above the benchtop act to direct light towards both work space and eating areas. The range hood light, located within overhead cupboards, is switched separately. The appliance, when not filtering air, can also allow the kitchen to be softly lit creating another level of ambience. Amanda Richmond is an experienced and highly creative Interior Designer and is in partnership with Andrew Fedorowicz, an Architect with over 32 years’ experience. Together they are Balance Architecture + Interior Design. Finishes boards are a way of collating your material decisions and help to consolidate your design direction. Having all the materials you have carefully selected in one place allows you to see how they work together and inform your decisions for purchasing future soft furnishing and furniture. You can see instantly whether the colours and textures of curtains, furnishing, cushions, rugs and decorative pieces will complement the colours and materials you have chosen for your home. When you have considered and confirmed your choices for your interior design by viewing your finishes board you can then document your material choices into a finishes schedule. This is a very helpful document which you can use to inform contractors of the exact specifications of the materials to be purchased and installed. An informal finishes board could include fabric swatches, evocative images or natural elements that together inform your unique design direction. In this image of a finishes board we can see there is an interest in natural features; the more affordable Kashmire granite laminate to be used in the laundry mimics the more expensive Natural Granite intended for the Kitchen. Fabric to the top of the image shows colours and textures shown in remaining materials. Amanda Richmond of Balance Architecture + Interior Design recommends the use of a finishing board with her clients and encourages you to start your own if you are starting to plan an interior design, whether it be for a new home or a renovation of your existing home. Amanda is a very experienced, award winning Designer based in Melbourne and has been creating gorgeous interiors for nearly ten years. To book an appointment to discuss your future interior design please call or email. The quality of the light in a space is crucial to the success of the interior design. This exquisite bathroom design was created by Amanda Richmond of Balance Architecture + Interior Design, a Melbourne based business that specialises in an integrated approach to architectural structures and interior design. Light is reflected into the bathroom with the clever use of mirror placement. A large wall mounted mirror enables full length viewing with light being reflected back into the room via the adjacent window and a wall hung decorative mirror. To ensure the wall was able to carry the weight of the large full length mirror, extra stud work was installed within the wall prior to plastering. A pleasing, clean line is carried through the space by using Carrara marble tiles to line the floor and continue up the wall to ceiling height within the shower space. The clean lines of the space are further maintained by concealing the toilet cistern within the wall; plumbing is accessed via a chrome wall mounted push plate. The vanity table becomes a feature of the bathroom and was custom made to allow asymmetric positioning within the space. Both the table and bath spouts are free standing and exit through the floor, with a power point being located at the other end of the table. The ceiling to floor sheer curtaining addresses privacy issues at the same time as providing a romantic, softened finish to the room. More privacy is afforded through the use of a frame mounted block out blind. This bathroom design is a great example of the high quality, creative concepts the experienced, professional team at Balance Architecture + Interior Design deliver to transform your home.